The North American Elk, scientific name Cervus elaphus, is one of the largest members of the deer family. Only outsized by the moose, elk number close to one million in the United States. According to the Rocky Mountain Elk Foundation, elk numbers were close to 10 million before Columbus. The word "elks" is technically incorrect as the word "elk" is both singular and plural. Elk females or cows usually give birth to their calves or young elk late May through early June. At birth, calves weigh between 33 and 35 pounds. Most cows give birth to one calf, but occasionally they will give birth to two calves. The elk cow leaves the herd to give birth to her babies. Like deer, elk calves are born spotted and scentless. These adaptations help camouflage the calf as it lies motionless in the grass. Elk calves will lose their spots by September. They are able to nurse off their mother for two to five months, and rejoin the herd with their mother after two weeks. Calves start eating grass younger than one month old. At about six months, the young elk calf is about the size of a full-grown Whitetail deer. The elk calf stays with its mother until the next spring when the cow has new babies. A female elk calf can reproduce at one year of age. 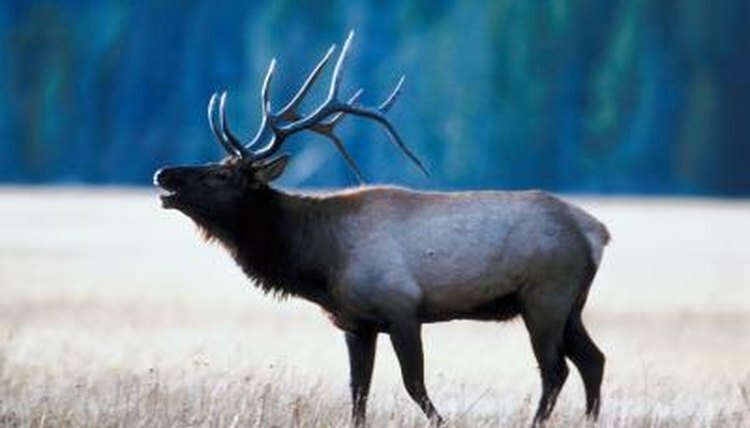 Male elk or bulls are not sexually mature until two years of age. A yearling bull elk is called a spike. Elk mate during the time known as the rut. The rut occurs in the fall when adult elk gather together. During the spring and summer, bull elk have grown their antlers and they are now hard bone. Mature bulls compete with each other for the right to breed the most females in what is called a harem. Bulls younger than 5 years and those older than 11 years seldom have harems. Bulls will bugle, that is, make a high pitch whistling noise to challenge other males and to warn off any potential competition. Bugling also attracts female elk and this sound can carry for miles. Female elk's estrus cycle lasts between one to two days. Elk calves are born between 240 and 262 days after mating. Elk typically live to around 12 years old in the wild. Captive elk have been known to live 25 years.